Mark Harris, right, talks with Jahnmaud O. Lane during an election party in Raleigh, North Carolina, on Tuesday. 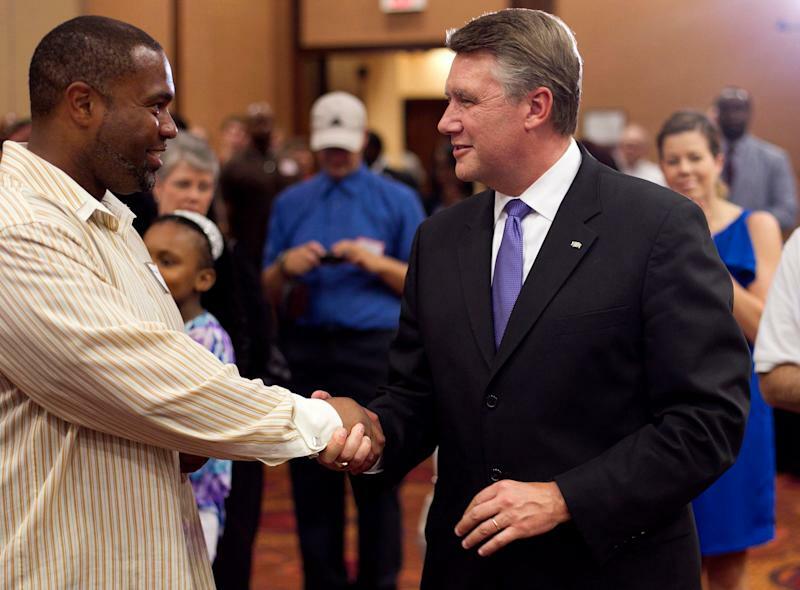 Mark Harris, a Baptist pastor with a long history of social conservatism, won the GOP primary in North Carolina’s 9th Congressional District on Tuesday night, ousting Rep. Robert Pittenger. Pittenger is the first congressional incumbent of either party to lose a primary this cycle. Harris’ upset victory could make it easier for Democrats to pick up the seat in November. The 9th District is on the Democratic Congressional Campaign Committee’s list of targets. Dan McCready, a former Marine Corps captain who founded a solar farm company, easily won the Democratic primary. The district, which Trump won by 12 percentage points in 2016, stretches through the central part of North Carolina’s southern border. Republicans have held the seat since 1963. But McCready has nearly $1.2 million in his campaign account. Pittenger and Harris sparred over each other’s relationship with the president, with Harris alleging Pittenger falsely claimed the president’s endorsement and Pittenger accusing Harris of trying to deny Trump the nomination during the 2016 presidential primaries. This was Harris’ second attempt at defeating Pittenger. He lost by just 134 votes in 2016 in the closest congressional primary of the election cycle. In 2012, Harris led Vote for Marriage NC, which successfully pushed a state constitutional amendment defining marriage in North Carolina as between one man and one woman.